With the power of shadows at his beck and call, master thief Garrett returns to PS3 and PS4 in 2014 with a new bag of tricks. The well-loved stealth series has always empowered gamers with a broad array of in-game choices, whether it was using lethal or nonlethal tactics to drop nosy guards, or leveraging magic and technology to overcome adversity. The upcoming Thief is no exception. In order to learn more about Thief’s stealth systems, storytelling, and PS4 benefits, we turned to Producer Stephane Roy. He shared some incredible insight into Thief’s design process, and even sheds new light on how DualShock 4 will empower PS4 thieves. PlayStation.Blog: While developing for both PS3 and PS4, do you have any predictions for what’s possible on PS4 that isn’t possible on PS3? Stephane Roy: There are multiple components to this question; an AI component, an audio component, an art component. It’s very important for us to immerse players in our universe. We want to make sure players really feel like they’re Garrett, that they’re part of the environment. So on our side the immersion is key. And honestly, with the PS4, it’s just amazing to see how far we can push this immersion. PSB: The DualShock 4 has several new features, including the light bar and touch pad. Have you put any preliminary thought into how the team will leverage these technologies? Roy: We want to take advantage of as many new, next-gen features as possible, and that includes the new DualShock controller. For the DualShock 4, we use the light bar to reflect the light gem in the in-game UI, which indicates if Garrett is in the shadows or not. It creates a nice feeling when you play in the dark to see it illuminate or darken as you move through the environment. Additionally, the touch pad allows for better menu navigation and makes for a more intuitive way to perform various actions, like navigating the map or selecting weapons. What impressed us were not only the new features of the DualShock 4, but how the existing ones have been improved. The best example of that is the motion control, which is way more precise than before. You can use it to adjust your aiming with the bow and the level of accuracy we get with it is really impressive. The last thing is the share button. We think it’s a great addition, especially for a game like Thief. We give a lot of freedom to the player, and we work really hard to create a systemic AI that will let the player find creative ways to play. Sharing those moments will showcase how they solved various situations — and we’re pretty sure that players will find ways that impress even us. PSB: How has the overarching vision for Thief changed over time? Have there been aspects that have remained constant, throughout development? Roy: As any other game in development, Thief evolved and matured as the team has worked on it. The high level vision remained constant; we always wanted to give the player the experience of playing as the Master Thief, the light and shadow gameplay, and the ability to play with the AI. Some changes happened in the gameplay that support that core experience. That’s a normal process. As you solidify your core experience, you always experiment on the side, trying to push the envelope further. PSB: How will Garrett’s story unfold? Will the narrative echo the same themes as the first three Thief games, or will it diverge from the norm? Roy: The story in Thief is completely new and isn’t connected with the old games. Players new and old will be able to jump straight in and enjoy the story right away. It’s a fresh opportunity to fall in love with Garrett all over again. The main narrative arc is played out over a series of “missions” that the Master Thief will undertake as part of the storyline, but the player will be able to return to The City between each of these missions and explore and interact with supporting side content. PlayStation.Blog: How is this Garrett different from the Garrett of past Thief games? Did his design undergo any major alterations during the design process? Roy: We always loved the Master Thief archetype that was present in the earlier games, and so we took the construct of the Garrett personality and built a new version of him from there. Even though he’s not the same character from existing titles, you’ll quickly recognize signature traits; internalized, dry, sarcastic, clever, selfish, and so on. He’s the master of everything that he does… except when it comes to relationships with other people. Seeing how such a fiercely private and independent spirit deals with issues like that is quite compelling. PSB: How has the actual play of Thief changed? How has it stayed the same? Has the team learned anything — positive or negative — from other modern stealth games? 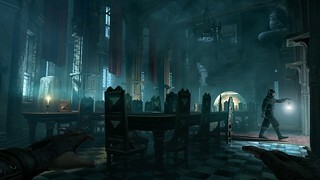 Roy: The core of the stealth in Thief remained the same, as it is primarily a game about light and shadow. The game evolved around that aspect, in how we improved the AI, the navigation, the readability, and the structure of the game. We also took time to look what the other games were doing to make sure that we would make the best Thief game. We looked at how they were introducing their mechanics, how they were making the stealth aspect more accessible, and it helped us to find the right balance. But we didn’t only look at stealth games. For the body awareness in a first-person game, we saw what DICE achieved in Mirror’s Edge and the latest Battlefield, and it was something we knew would add a lot to the immersion of Thief. PSB: How does the stealth mechanic work in Thief? Is it a light/dark system, line of sight, or something else? What are the pros and cons of these systems? Roy: When people think about the stealth in Thief, the first thing that comes to mind is the light and shadow. It is the core of our stealth, but it’s not only about that. We have a complex perception model that creates realistic situations. Being in the shadow reduces the visibility of the player, but the position of the player, their movement, and the distance all change how the AI perceives Garrett. We also model the sensors of the AI as realistically as possible. We distinguish between central vision and peripheral vision. This also is put forward by the way we use head tracking to make the AI look more believable when they react to something and look at the player. And there is also the sound that will attract and alert AI. Players can control the sound they emit by controlling their movement speed, but it’s also influenced by the surface they walk on. Together, these elements create a realistic AI, but also an AI that’s fun to play with, that the player will be able to distract, evade, and try to outsmart. PSB: Is eavesdropping still employed as a narrative device, as it was in the previous games in the series? We want to make sure that the world is rich and interesting, so our writers are working hard and we’re producing a huge amount of dialog that the player will be able to listen to, as Garrett sneaks through the shadows. Some will give him information for his mission, some will unveil story elements, and others are just fun to listen to. PSB: Are players still presented with lethal vs. non-lethal decisions to resolve stealth and combat situations? If so, has early testing found emerging trends in player behavior? Roy: The player always has the choice of how they approach a situation, and we make sure the game doesn’t restrain them. Every mission supports both the ghost player, who wants to play without killing anyone, without being seen, and the predator, who wants to use the shadow to quickly dispatch enemies. During internal playtests, we always find that there are some players for both ghost and predator play styles. We also see that most players enter a third category, those we call the opportunists. Opportunists play a little bit of both, going back from lethal to non-lethal, and trying to use various tools and the environment to take advantage of each situation. Having those three styles of play gives us a nice challenge, because we want to support them evenly and we are creating rewards for each one of them. PSB: Item collection and stealing have been tremendous aspects of the Thief series. Does this have any impact on the team’s Trophy design? Roy: Yes, collection and stealing are really important. Since it’s a core aspect of the game, it made sense that some of the Trophies would be awarded based on looting and collecting special items. 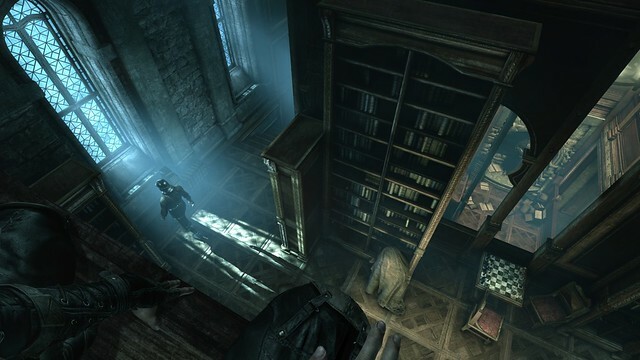 PSB: Although the Thief series has primarily used a first-person camera, Thief 3 did include a third-person option. 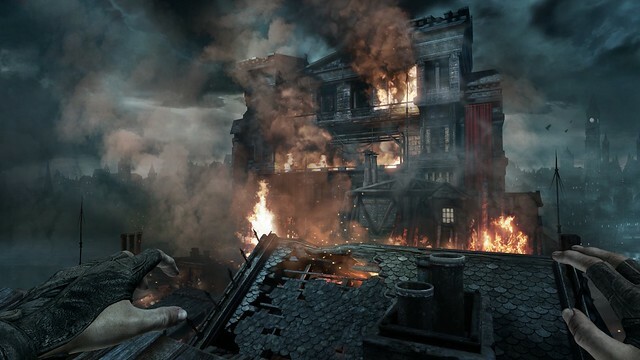 Will there be similar view options in Thief? Roy: Thief is primarily a first-person game. We worked a lot to create a really immersive environment, and integrate body awareness that really makes you feel like you are standing there in the shadows, about to steal that golden cup… To achieve this level of quality, we needed to focus on one view for those sequences. We still use some third-person camera, but only in specific moments when it fits the most, like a navigation segment or performing take downs. 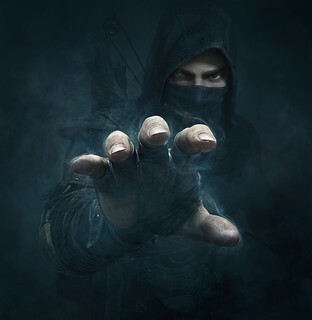 Thief is in development for PS3 and PS4, and scheduled to launch on February 25th, 2014. Ryan, next time you interview them, ask them why they’re making it so that Garrett can’t jump unless the game allows us to via an on-screen prompt or why the rope arrows only work contextually instead of letting us fire them whenever we want. All of the early games let us freely jump and freely fire rope arrows and this one doesn’t. It can’t be a technical limitation because the PS4 is the most powerful gaming console ever made and I’m pretty sure those early Thief titles could be ported pretty easily to PS4. And if they could do it, so could this one. Never played any Thief game before but saw this at E3 and I know without the slightest doubt that Thief would be better in 3rd person….but anyway the game looks good.I’m not a graphics wh*** but I saw the game at E3 and its another one of those games that looks just like PS3 graphics.Well I’m looking forward to this game. Sounds interesting indeed as long as there’s no forced multiplayer component to this game. I just might be inclined to check this out PS4 day out!!!!!!!!!!!!!!!!!!!!!!!!!!!!!!!!!!!!!!! I meant PS4 day 1 out my bad !!!!!!!!!!!!!! I have just finished reading the official PlayStation Magazine.UK….Only because they have stop printing the official PlayStation Magazine,THAT USED TO BE ABLE TO GET,IN THE USA..Thanks Future Publishers…Why is there not a Official PlayStation Magazine being printed here????????????? ?There is no reason,for it!!!! !I and a my more people are very curious!!!!! !When will US PLAYSTATION and Sony fix this.We are having some of the most exciting times,in a decade,almost……We have no publication for Sony and the new hardware and software,then stay informed!!!!!!! !There has to be company!!!! !That can listen to logic and the fans and PlayStation owners.We have no help from Future Publication………All I can get is there is no reason to have stop it!!!!!!!!!None!!!!! !The UK PlayStation Magazine recently said it was n or very next-gen.As far as controls a and movement….It will be nice to get an United States PlayStation Magazine,AGAIN!!!!! !Please let Mr.Sony and Mr.North American President KNOW!!!!!!! !